As you may or may not know, I host an international picture book exchange on Instagram, and I recently received my book in the mail! And I couldn't have asked for a better gift from Rossa from @curiouslittlepeople!! 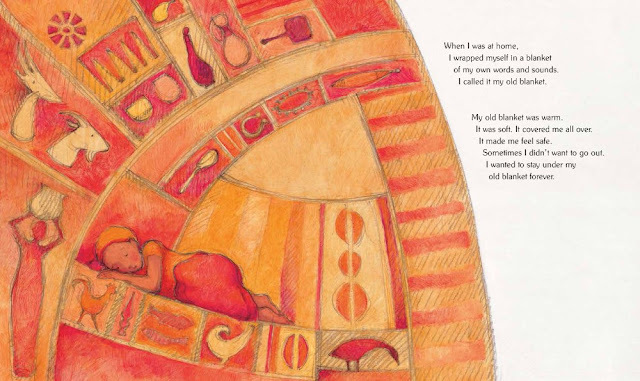 Irena Kobald and Freya Blackwood's My Two Blankets tells the story of a young refugee girl named Cartwheel and the difficulties she experiences with assimilating into her new culture. Cartwheel moves to a new country with her auntie shortly after a war in her home country. But everything is strange: the food, the animals, even the wind. The only comfort she has is an old blanket. 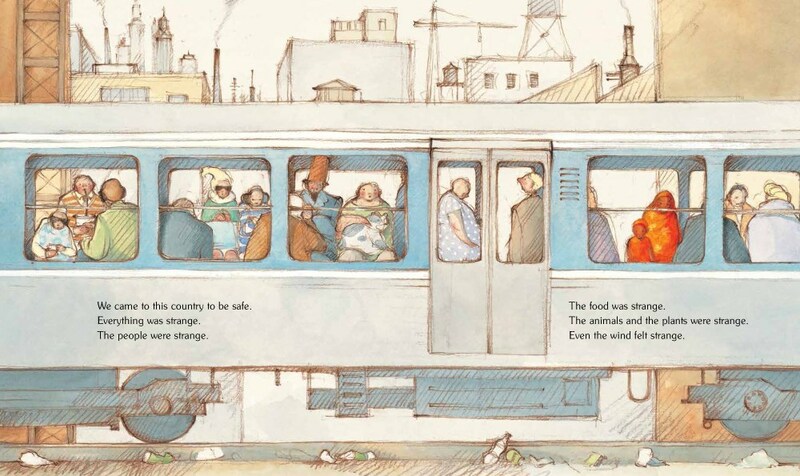 It's hard not to feel the despair, both in the text and the illustrations. Cartwheel is very open and honest about her feelings, refraining from metaphors readers cannot comprehend or understand. She sticks to the facts and tells her story like it is: she moves to a new country to be safe, she doesn't feel like herself anymore, sometimes she wants to hide under her old blanket forever. But when she meets a young friend, her attitude quickly changes. Blackwood is wise to use blues and oranges, which are complementary colors. They wonderfully reflect the opposing cultures that Cartwheel encounters. Every time we see Cartwheel in her new environment she's wearing bright oranges, surrounded by a sea of light blues. Not only does she feel like she stands out, readers can actually see that she stands out. And it helps them sympathize. As Cartwheel and her new friend bond, we see Cartwheel gradually begin to accept pieces of her new life into her own, transforming her from strictly orange to a combination of oranges and blues. It's a beautiful visual for how hard it is for newcomers to accept their new surroundings. Of course, there's a lot more to this book. The guilt this poor girl feels at wanting to assimilate and the subsequent journey she takes toward better understanding her role in this new culture are touching and honest to the refugee experience.